Since TerrainComposer2, TC1 is deprecated and not available anymore on the Asset Store. However TC1 is included for free with TerrainComposer2 as a download link. TerrainComposer is an Unity Extension Tool that enables developers to compose AAA quality Unity Terrain. It is also a Scene/Level Composer. It uses the standard Unity Terrain, and with a few clicks you can create astonishing results. It has a friendly GUI interface, is very easy to learn and its unlimited multi-threading output possibilities makes it a very powerful tool. Creating terrain that normally takes days or weeks to make, with this tool it only takes a few minutes! Saving you tons of work and time. Speed, quality and realism is the strength of this tool. And it’s curve, layer and filter based! The possibilities are endless. The layers and filters can be used for example to blend splat textures on height, random, degree, normals or an image etc. A small change in a curve or filter gives a totally different terrain. TerrainComposer 1.9 is released and is Unity5 ready it includes 5 complete examples terrains that run out of the box in 3-4 clicks. TerrainComposer is very flexible and can be used for all kinds of terrains and environments. For example flight simulator perspective as well as first person perspective. You can create low detail high performance terrain for example the mobile platform, as well as high detail AAA terrain for high end graphic systems. It supports all terrain resolutions high and low, as well as the support for multi-terrain, which is totally automated. For multi-terrain there are quick buttons that apply settings from one terrain to all terrains. 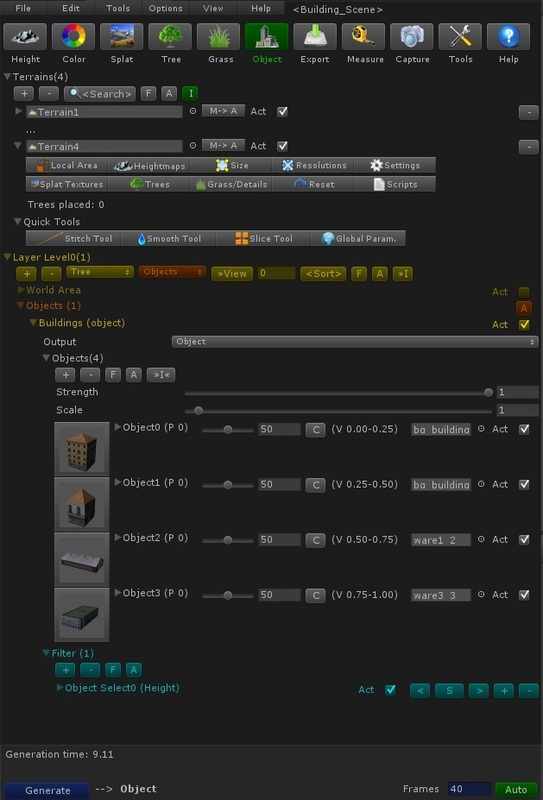 These buttons are in more components like the tree and the object layer, which apply settings for example one tree to all the trees in a layer. The auto generation option makes it very easy to see changes you make directly in the Scene view. This allows for much faster work flow as well as learning curve. The unlimited multi-level placement makes it possible to create endless detailed Scenes, where you for example create a whole city where the outside of the building has a garden and the inside of the building is furnished, and with objects on and around the furniture, etc. In the ‘Screenshot’ page you can see different screenshots of what I made so far with Terrain Composer, the terrains I made inbetween programming, much and much more is possible. Video quality can be set higher in settings at the right buttom of the video screen. New Video about 100% procedural heightmap and splatmap creation from scratch. This is a runtime video of terrain made with TerrainComposer from the tutorial video on the video page. On the video page you can find more videos.